During every awards season, there is a week in between when the Sundance Film Festival takes place which is somewhat coincidental seeing that the awards ceremonies are celebrating the films that have been causing a stir over the past few months, and Sundance is the very launch pad for many of them. The event is in essence a great forecast of what to expect in the coming months, and some of the films shown end up being nominated for awards the following year. It is a buzzing event where celebs, filmmakers and media-ites gather in Park City, Utah to showcase new talent, new content and talk about industry trends. 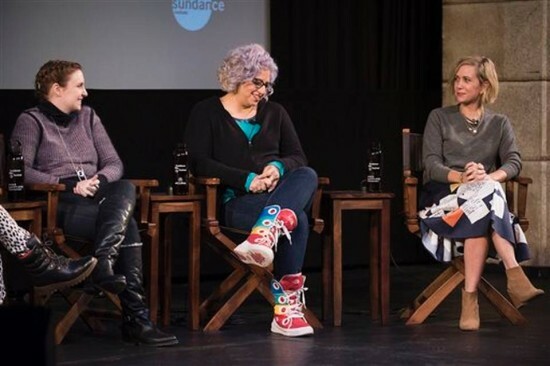 Given that women have been making great strides with loud voices in media and entertainment over the past couple of years, it comes as no surprise to us that the ‘Power Of Story: Serious Ladies’ panel was the hottest ticket in the snow this year. The panel featured a line-up of women who together would literally make our TV dreams come true, but separately are already doing majorly badass things in entertainment for women collectively. 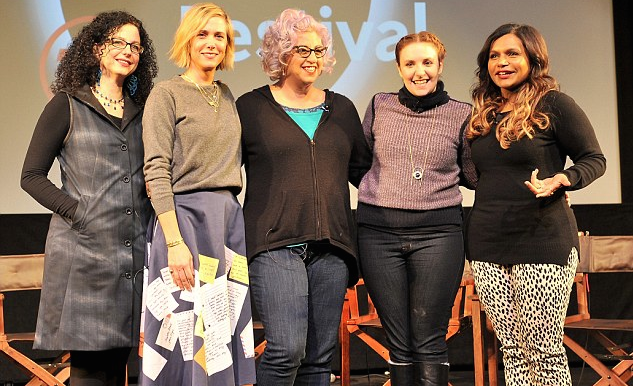 Mindy Kaling (creator and star of ‘The Mindy Project’), Lena Dunham (creator and star of ‘Girls’), Kristen Wiig (‘Saturday Night Live’ and ‘Bridesmaids’ star) Jenji Kohan (show runner for ‘Orange is The New Black’) and New Yorker TV critic Emily Nussbaum. “The fascinating range of three-dimensional female characters on film and television these days suggest a sea change in the cultural zeitgeist. They’re smart, sexual, funny, and flawed; they upend expectations, thwart our sympathies, and complicate the way we talk about gender roles,” said the website description about the panel. Anyone else have FOMO right now? The group were discussing the state of women in film and television and all of them had some interesting things to say, given their own experiences and achievements. First up Lena Dunham likened these type of “all-female” panels and the way they are marketed as some sort of weird gimmick, as opposed to just regular entertainment industry folk. She said it’s like “the thing where it’s the only two gay people in a small town so you set them up even though they have nothing in common.” Check. Mate. “That’s what a lot of panels about women in television are, but these happen to be women who inspire me, whom I feel kindred to,” she continued. Jenji Kohan made a great point that television right now offers more opportunities for women, especially with emerging new media platforms such as Netflix (where she is enjoying gangbusters success with OITNB), Amazon, and Hulu. Mindy Kaling, who has her own prime time show on broadcast television, mentioned that TV has arguably always been a very female-friendly platform with shows such as ‘I Love Lucy’ and ‘The Mary Tyler Moore’ from decades ago. And now with shows such as ‘Greys Anatomy’ and ‘Scandal’, that momentum is continuing. “Shonda Rhimes has a bunch of shows and they’re all starring dark-skinned women. And they get huge ratings.” Another check mate. Many of these women faced their fare share of hurdles just getting to the enviable position they are in today, which they shared with the audience. Lena spoke of how she was shopping around the ‘Girls’ idea with many executives who often brushed her off, before HBO eventually said yes. “It became very clear to me very quickly that the kinds of stories I wanted to tell were not going to get told by studios,” she said. Female show runners in TV are a rarity, but we are certainly starting to see more of them, Jenji being one of them. But she too faced the gender backlash. 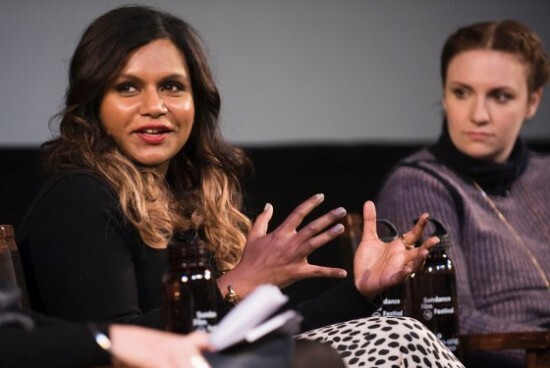 Mindy Kaling spoke about how the desire to portray a strong female character can often be a tricky point for female creators of a show. The issue of double standards was also discussed when it came to character representations of a show’s creator as well as how people perceive male and female comedians. Lena got annoyed that many accuse her of writing Hannah Horvath entirely based on her, and said the same thing happens with Mindy, whose lead character on her own show just happens to have the same name. “There’s a reason people have trouble differentiating between me and my character, Mindy and her character. We basically share a name; there are stylistic similarities; we have the same voice; we have the same face. But at the end of the day, I don’t think that like, Larry David or Woody Allen or anyone else playing some version of themselves is walking around with a million people who think that everything they say in their films is [what they actually believe],” she said. Kristen Wiig said it bothered her that comedy is often put into a gender pigeon-hole when it comes to women. Nevertheless Lena Dunham chimes in saying the female identity is a very important part of what she and the other women are doing because they are widen the scope of representation. As the group fielded questions from the audience, Lena took the opportunity to promote a Sundance documentary called ‘The Hunting Ground’ which focused on sexual assault on college campuses. “Women on college campuses actually are some of the most privileged women with the loudest platforms to tell their stories—most of them are middle class, most of them are white, and they still can’t be heard as survivors of sexual assault,” Dunham said. “Sexual assault is everywhere, and women are never heard, [so] I think that campuses are a great place to start because that’s where we’re being educated and that’s where we’re told we’re going to be safe,” she concluded. The best quote which summed up the plight of women in entertainment and what the panel was all about, was from Mindy Kaling who basically exposed where her confidence comes from, as well as her success.